This is what I call FAMILY FOOD – there is something in it for everyone. We currently have my daughter and her husband living with us – with my three grandsons, 1, 4, and 7 and trying to find something that everyone likes to eat can be a bit of a mission – yes, one can tire of pasta! Not only does everyone love this dish but it is very versatile – you can make it with whatever local produce is in season. 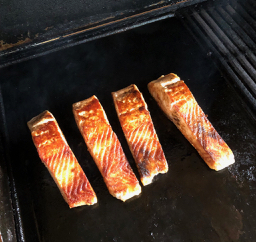 You just need some good potatoes and crispy skinned barbecues salmon to make the bones of it (without the bones!) – the rest is up to you. Let’s start with potatoes. 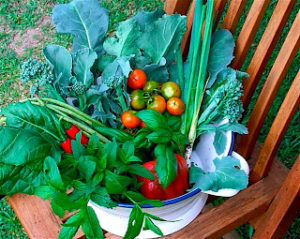 There is nothing quite like freshly dug, homegrown potatoes AND they are so easy to grow. I had come back from a holiday to find that my patch of spuds was ready to dig up – they take about 6-8 weeks. From one potato you get a couple of kilos. 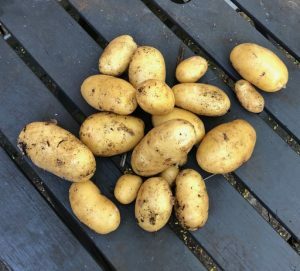 I’ve written before about my joy of digging up potatoes – Aladdin’s cave – from one you get a whole bucketful of jewels These are mine. Delicious, waxy, yellow potatoes – just perfect for this dish. You just have to boil them until tender and the skins will easily peel off. Dice them and add all your favourite ingredients – her goes. now we come to the fun bit – any or all of these: parsley, diced cucumber, shaved fennel, lovage, celery, olives, finely diced spring onions or chives. to make the dressing: 1 tbsp Dijon mustard, juice of 1 lemon, freshly ground salt and pepper and 100ml olive oil. Whisk together and pour over the assembled salad. Cook the potatoes, eggs, asparagus/beans and barbecue the salmon. Assemble everything in a large salad bowl having wiped a large clove of garlic all over the inside of it. (My godmother taught me how to do this in about 1967 when she made us lunch in her Maida Vale Mansion Flat – see Rumpole of the Bailey). It imparts flavour without being overpowering. Whisk up the dressing and pour over the salad. 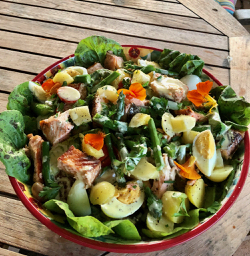 You would not be wrong in thinking that this sounds a lot like a French Salad Nicoise except here we have substituted the salmon for canned tuna. Bon apetite.